As I booked our family flights to the Philippines for our New Years adventure, I knew that coming from Canada, there was no way to book a direct flight to Manila. Instead of wasting a stopover with a few hours stuck at the airport, I looked instead at how to get as much adventure into a 24 hour period. And with our options, Shanghai was looking pretty incredible! We worked out a way to get a full 24 hours in Shanghai and I began researching the best ways we could spend our time. When asking the boys for ideas, it was clear that eating LOTS of dumplings and noodles would need to be part of the plan. And after past fun food tours in Toronto, we knew we were in for an incredible time! Though we could have explored Shanghai ourselves, because of our short time frame and jet lag, we opted to join a food tour to learn more about Shanghai cuisine and local culture. 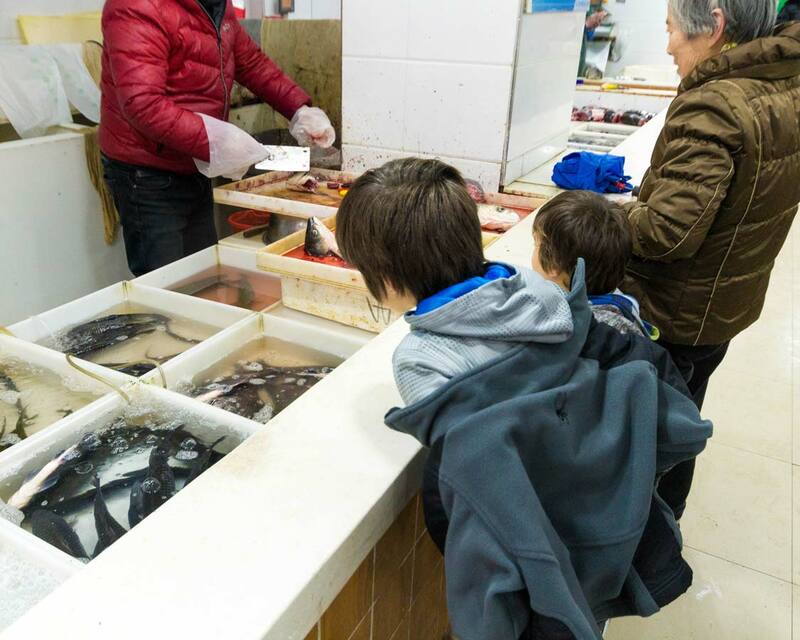 Researching food tours in Shanghai, China can be overwhelming with so many options available. We chose UnTour Food Tour as they marketed themselves as being family-friendly and food safety focused. And being that this was our first family jaunt in Asia, starting the trip with tummy trouble wasn’t on our agenda. UnTour Food Tours also had a morning tour option, which after the previous night spent exploring the skylines of Shanghai, was a perfect fit for our schedule. We awoke early to get ready for our Shanghai Food Tour. The morning street food tour is family friendly and lasts 3-hours long. We were told to arrive hungry. I was skeptical at first as this meant no breakfast and hungry children (and mommies and daddies!). At the start of a long day, hunger does not make for a fun family travel experience. 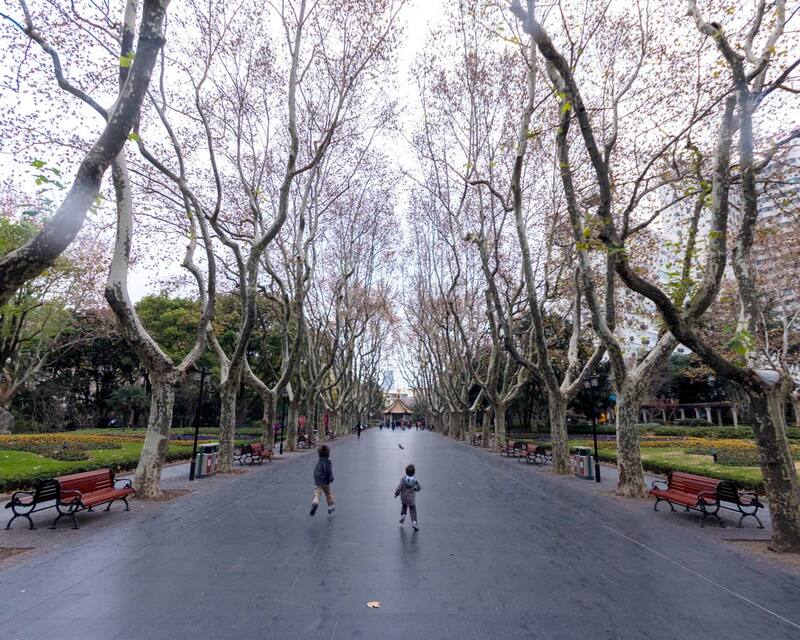 We met at Xiangyang Park in Shanghai’s French Concession at the pre-arranged time of 9:00 am. All pre-confirmation was done by email. We even received directions in Chinese that we could present to the taxi driver so we would not have any issues getting to the location from our hotel. Tip: For vegetarians, just let UnTour Food Tour know during the booking so they can make adjustments to the food received during the tour. The traffic that morning was light so we arrived 30 minutes early from the Eton Hotel. This was perfect timing as Xiangyang Park was full of locals busy with their morning routine. While waiting, we watched as a group of individuals participated in Tai Chi and various other morning exercises that are popular among locals throughout the day. 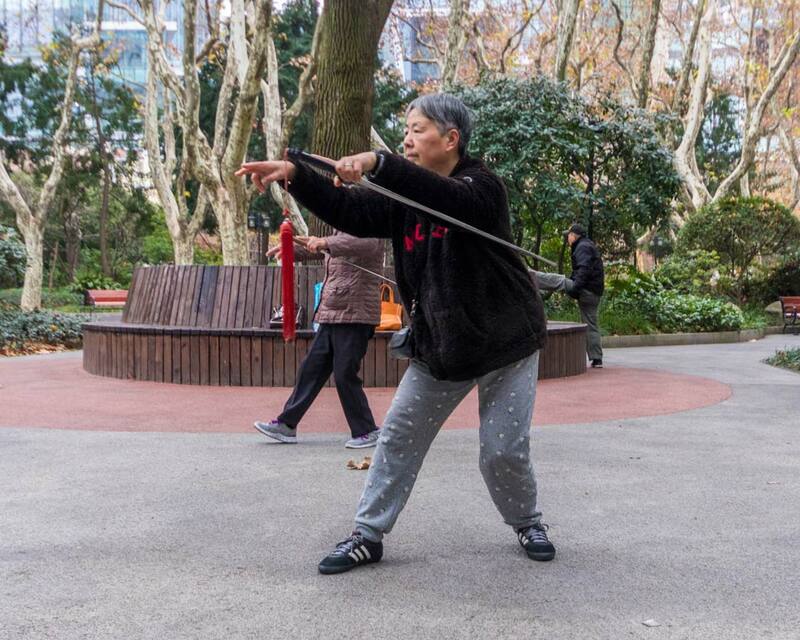 At another area of the park, C also noticed a couple of women practicing Tai Chi with swords. He was mesmerized and quickly ran to let D know. Both watched the women until they completed their morning exercises. The park also had a small playground. But just as the boys were about to test it out, our UnTour guide, Lee, arrived. After brief introductions, we were off to the former French Concession and our food tasting and walking tour were officially underway. Our first stop was near Changle Lu at the Xiangyang Food Stalls. After making sure we were settled in our tables Lee ordered our food. Although the street food is made to order, we didn’t have to wait very long for our platters of youtiao which was accompanied by a bowl of soymilk. Youtiao is like a cross between a crueller and a beignet. It has the texture of the former, but is shaped like a stick. The boys referred to it as breakfast donut sticks. In fact, it is commonly referred to as an oil stick because of its shape and the fact that it is deep-fried. We were told this a very common Chinese breakfast, and is best enjoyed when dipped in the soymilk. 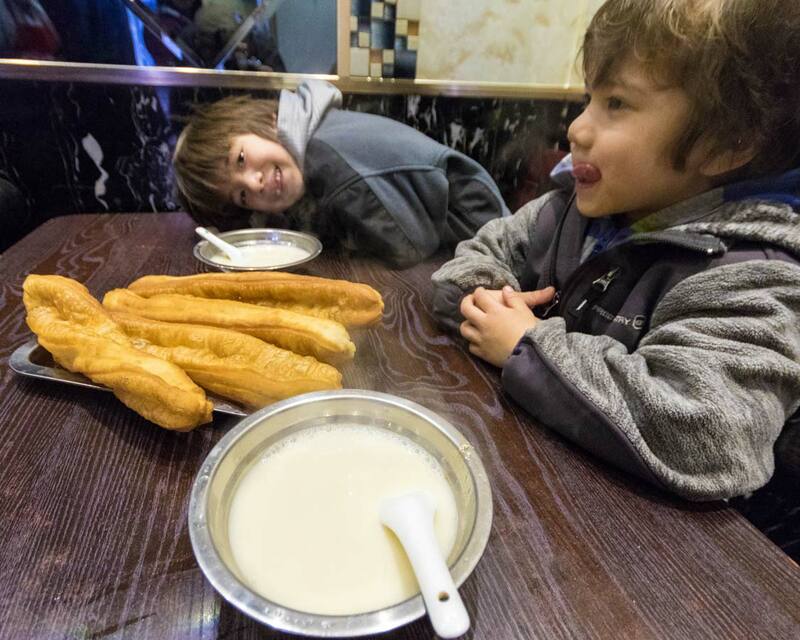 The boys and I much preferred youtiao in its original crunchy form so we opted to skip the soymilk dip, but Kevin really enjoyed softening the bread in the sweet milk. Next, we had potstickers. C and D were ecstatic! They couldn’t believe their donut sticks were being followed by dumplings, one of their all-time favourite foods. And all this before lunchtime! We practiced using our chopsticks while Lee explained that potstickers received their name because they are cooked while frying one side until it sticks to the pot. But once the potstickers had cooled down C and D gave up on the chopsticks and used their hands. Next, we stepped outside to watch our jiangbing being made. 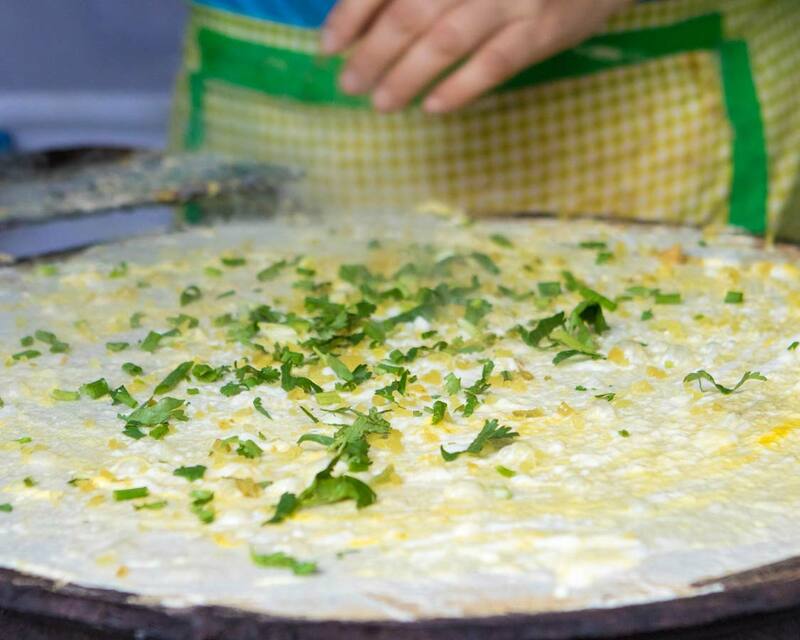 Also known as fried pancakes, jianbing is similar to a crepe. We watched in awe at how expertly the woman making them spread the batter into a paper-thin layer. Then, she added various sauces and topped it off with coriander. Last, she folded it over several times. All this took less than a minute! The jiangbing was crunchy and flavorful with just a slight spice to help us wake up. 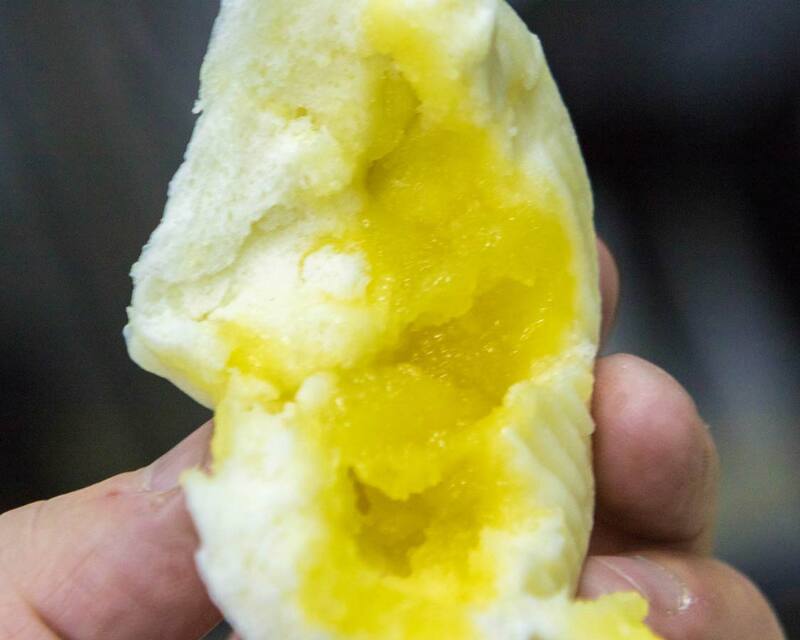 Just when I thought we were done at Xiangyang Food Stalls, Lee handed me a liu sha bao or custard bun. The bun was dense but fluffy at the same time. The inside was filled with an egg yolk that was both sweet and salty. Yum! By now we were getting quite full. I couldn’t believe this was only our first stop on the food tour. After cleaning ourselves up we left the Xiangyang Food Stalls and walked towards Julu Lu where we stopped for some drinks at Egg. The trendy expat run cafe was fronted by a huge window that allowed entry for lots of light. It made for a very welcoming atmosphere as compared to the cramped, bare-bones style eateries of the food stalls. The boys had some coconut water and Kevin and I tried the coconut cold brew coffee. It was a refreshing way to get my daily dose of caffeine. Lee explained that our next stop would be for noodles. The boys quaked with excitement. 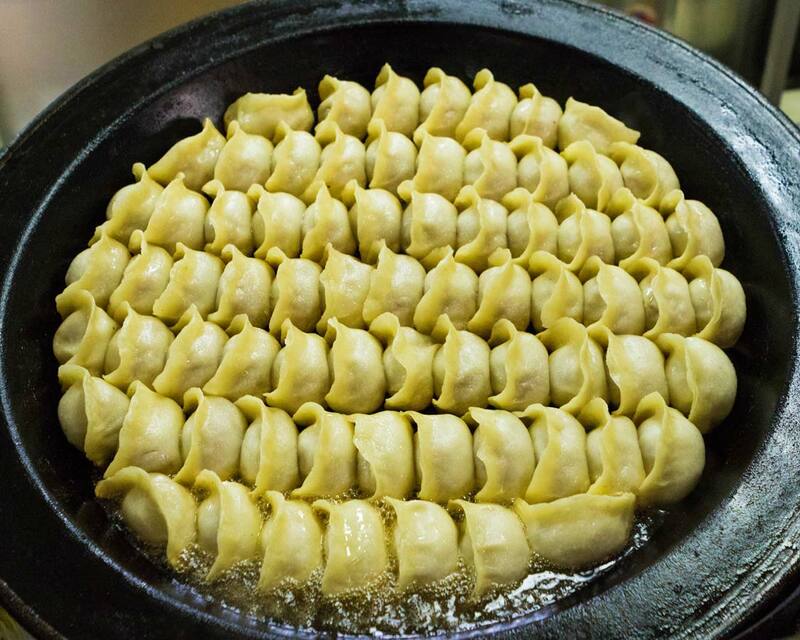 If there was one thing they loved more than dumplings, it’s noodles! They quickly stopped drinking their coconut water as they didn’t want to fill up. The restaurant was only a couple of blocks away. 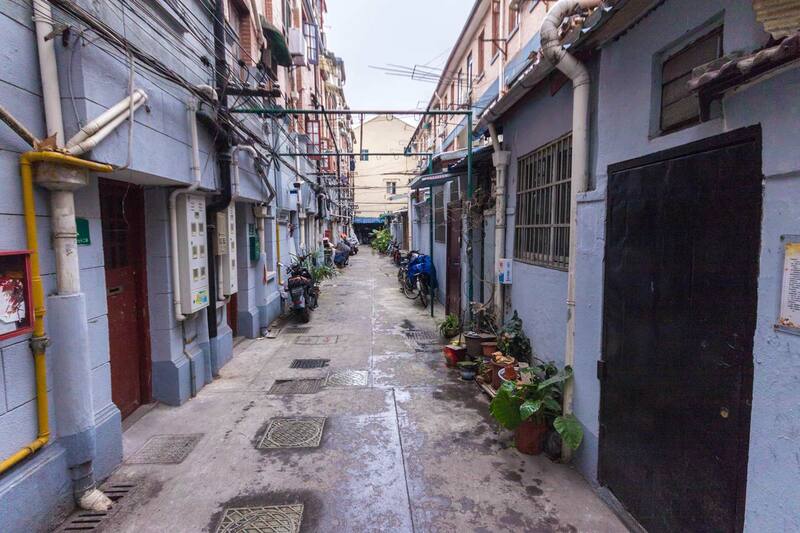 And along the way, we had a chance to wander through some of the urban alleys that many locals call home. It was fascinating to learn about the apartment style living in this incredibly densely populated area. Before I knew it, I was watching noodles expertly being pulled by hand. It was mesmerizing! Each batch is pulled 8 times before it is the perfect diameter for consumption. The noodles were cooked and at no time at all bowls of cong you ban mian (scallion oil noodle) were being cut with scissors and served in the upstairs dining area. The noodles were served plain with no toppings. Chili oil, soy sauce, and vinegar were all available on the table if needed. The kids couldn’t believe their luck! With no vegetables in their way, they devoured the bowls. But it was clear they were getting full as they were not able to finish it. Along with the noodles we also had some tasty bamboo tofu with peppers. Sprisingly, the bamboo tofu had the texture of chicken. At this point, I would have been completely satisfied if the tour had ended. We had been eating straight for two hours and I was definitely full. 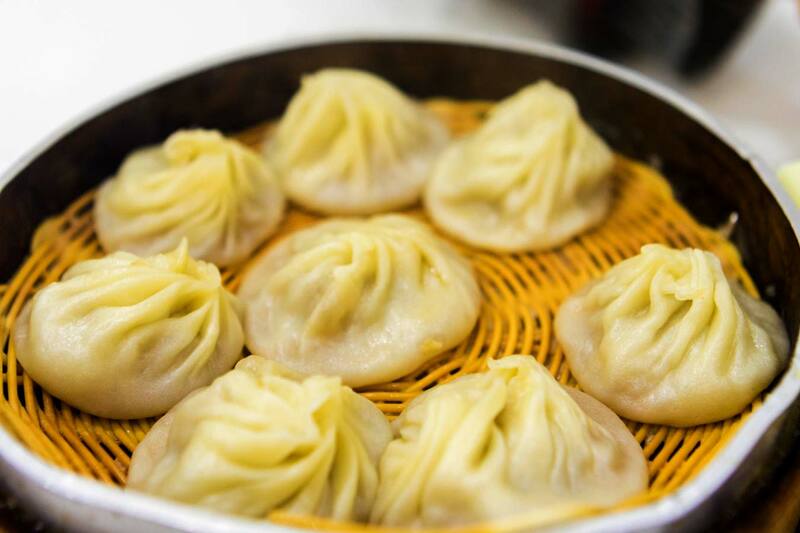 However, we had not yet tasted Shanghai’s famous soup dumplings, xiaolongbao. So, when Lee suggested we explore a local wet market we all agreed we could use the exercise. The boys were full of questions about the various types of fish, vegetables, and meats that were presented at each of the market stalls. As we walked towards our next stop, Lee told us about our points of interest such as the Propaganda Museum which is a popular spot for tourists to visit. Before I knew it, we were stopping at the last restaurant on our Shanghai food tour. At the entrance, I watched 3 people effortlessly make perfectly formed dumplings. I was brought back to reality when Lee beckoned for me to come over to the table so he could explain how we should eat our soup dumplings. Our xiaolongbao was also served with bowls of wonton soup. I had some of the soup first to allow my soup dumpling time to cool down. The soup was hot and the wontons tasty. But I didn’t want to have too much as I needed to leave some room for the xiaolongbao. I took my chopsticks and carefully picked up the dumpling from the top. I placed the dumpling to my mouth being careful to take a small bite to release some steam and poured the soup into the soup spoon on my other hand. I drank the soup and devoured the dumpling. It was definitely worth the wait! I thought at this point the tour had ended. But Lee had one more stop up his sleeve. 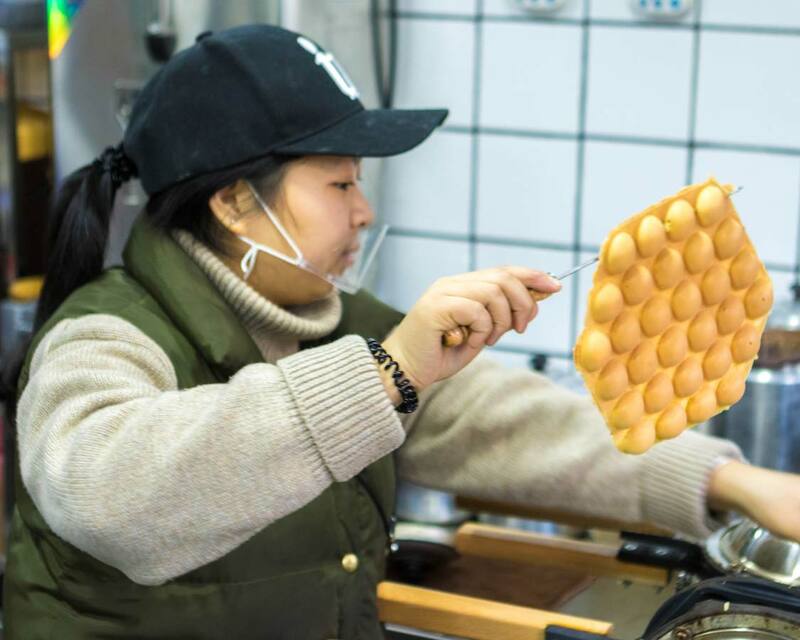 With our tummies full of soup dumpling and wonton soup, we stopped at a waffle stand to order a local delicacy, egg waffles. We tasted both the original flavor (which was slightly sweet) and the banana flavor. Both flavors were a huge hit with the kids but neither managed more than a small bite. Lucky for us, we were able to grab the waffles to go. 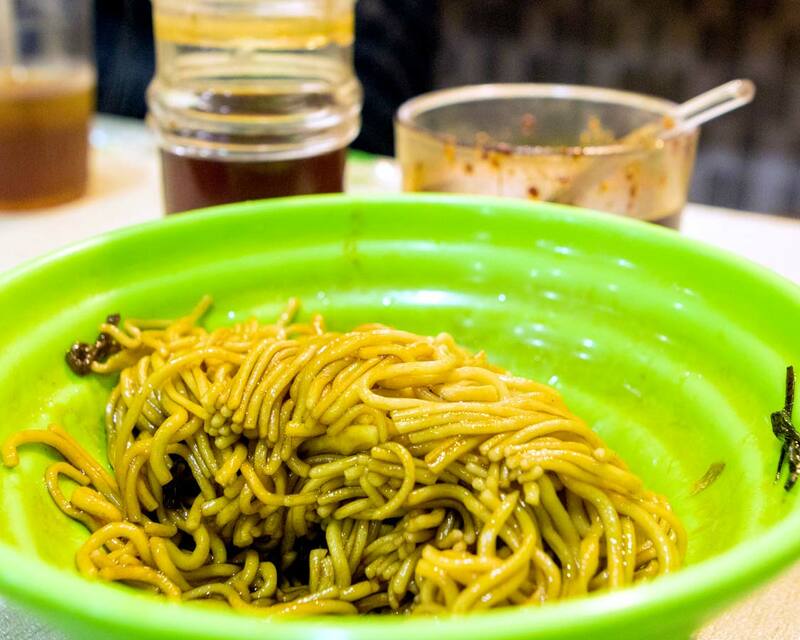 Is the Shanghai Food Tour with UnTour Food Tours worthy of a Shanghai Stopover? 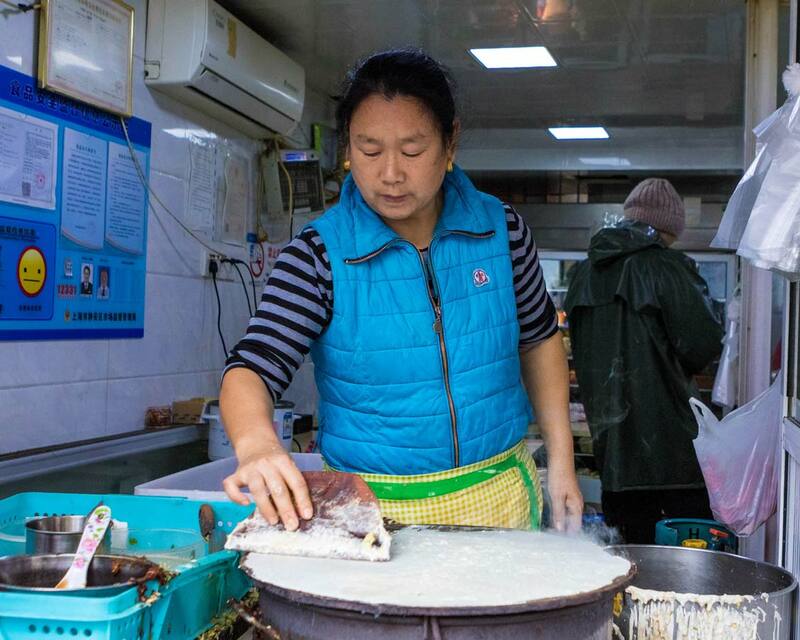 Our Shanghai Food Tour with UnTour Food Tours was a three-hour gastronomic experience. As we only had 24-hours in Shanghai, and we wanted to taste a variety of foods, we decided to join a food tour instead of venturing out on our own. I feel like the UnTour Food Tour definitely allowed us to understand the flavours of Shanghai and we attained a serious appreciation for Shanghai food culture in the limited time that we had in the city. The foods were also not so adventurous that young children would be nervous about tasting. Both C and D didn’t have to be coaxed to try any of the foods. Quite the opposite! They don’t understand why I don’t make these dishes for breakfast back home. Equally important, I didn’t have to worry about food safety thanks to the excellent safety record of UnTour Shanghai Food Tours. As an added bonus, we also learned a lot about the former French Concession of Shanghai. Disclosure: We were guests of Untour Food Tours during our time in Shanghai, China, however, all opinions remain our own. Wandering Wagars is a participant in the Amazon Services LLC Associates Program, an affiliate advertising program designed to provide a means for sites to earn advertising fees by advertising and linking to amazon.com, amazon.co.uk, amazon.ca. Amazon and the Amazon logo are trademarks of Amazon.com, Inc. or its affiliates. Boys after my own heart – dumplings and noodles! This looks like the perfect food tour for families and I love that they promote food safety. That’s always one of my biggest fears. No one wants tummy issues while traveling! And now I’m starving and going to steam some dumplings for lunch – though I doubt they will be as good. What a great way to learn about Shanghai. Everything looks yummy. I know my boys would love the dumplings and Youtiao. Some great info! My kids are dying to go to China – I’m glad I found this! OMG Xiaolongbao are so yummy! Doing a food tour is a great way to experience a place and I love the idea of doing an untour too. Looks like you had fun in Xiangyang Park too. I love people watching in cities like that haha. Christina, you have made me hungry!! Haha… thank you!! Food tours are such a fun way to get to know both a city and its food! I love all the kinds of bing in China. We didn’t explore Shanghai during our China trips, but it looks like it’s got lots of tasty offerings: I love dumplings!!! We’re not usually “tour” travelers, but it makes perfect sense to maximize a short time at a location, as you did. 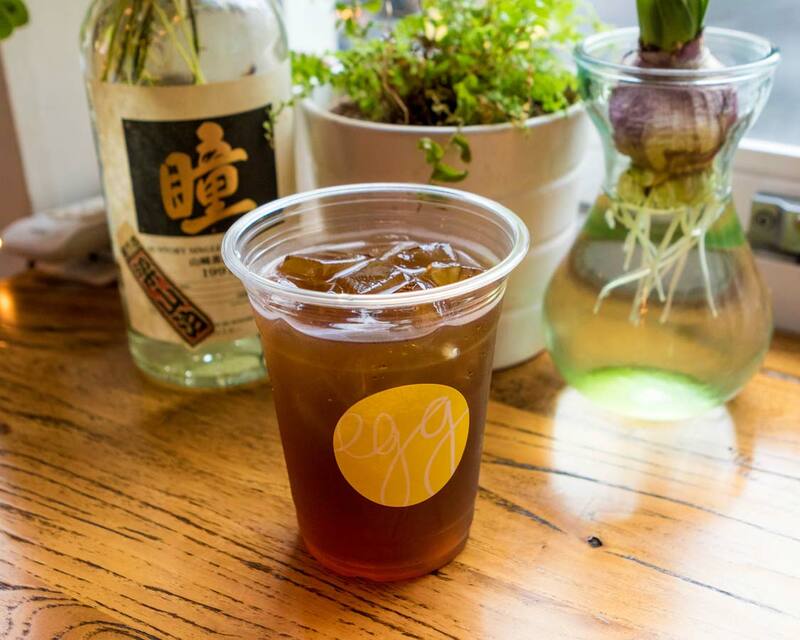 We’ve always heard about the amazing food scene in Shanghai and this seals it for a “must go”. 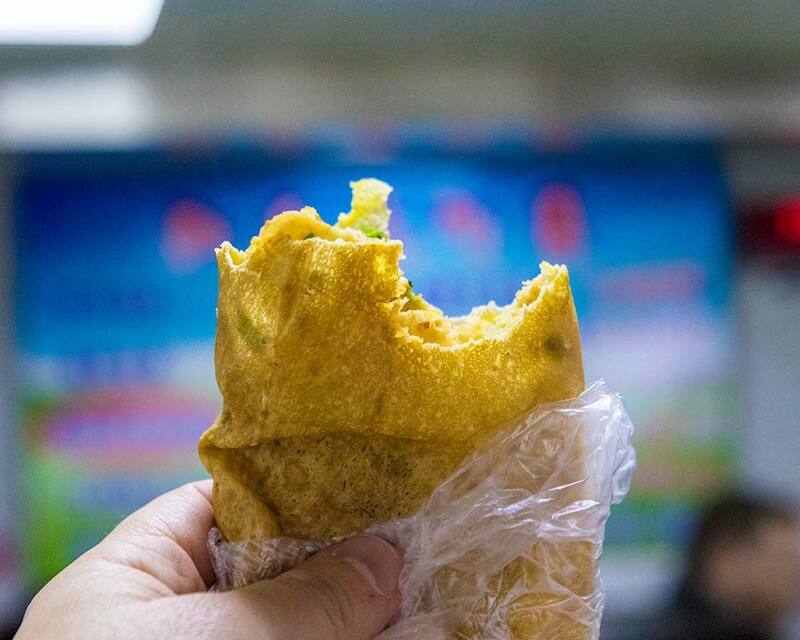 We love street food – made to order, along with the jiangbing, soup dumplings, and then waffles. Wow! We’re there. Can’t believe you guys devoured all of that in just 3 hours! Your post made me hungry as I was craving my favorite Xiao Long Bao just yesterday. I loved that the kids got to see how hand-pulled noodles are made. It certainly is fun to watch. Love the name Untour Food Tour. Food tours are a great way to understand the culture of a country and this one is no different. All the dishes look yum. 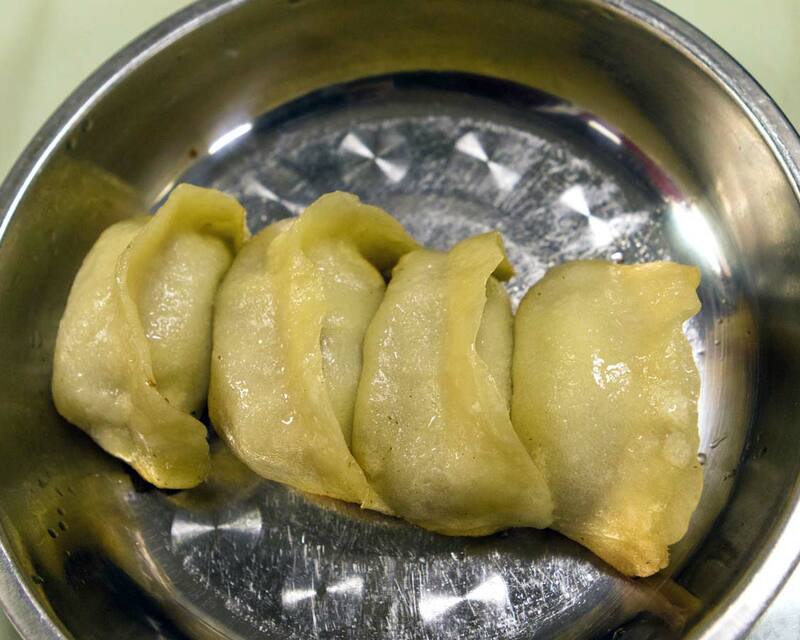 And I am pining for dumplings now. Potstickers and Youtiao for me, please! 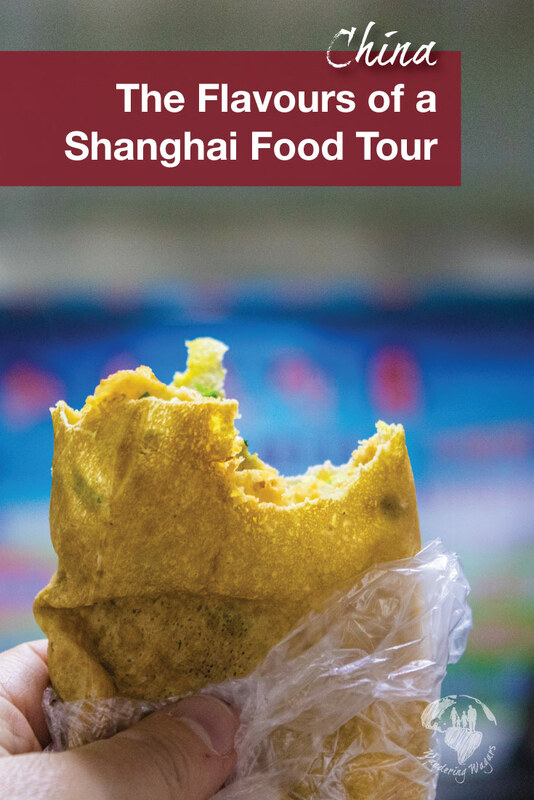 Great idea to take a food tour in Shanghai and Untour Food Tours sounds like they do a good job. As you’ve shown here, I think food tours are a great way for getting to know about a place beyond the food, too. Oh my!!!!! I made the terrible mistake of reading this before breakfast and now my Sunday crepes are not going to match up to this! My son and I would both adore this – he also has that love of dumplings and noodles. What a great way to enjoy a Shanghai stopover. I’m still a little nervous about street food, so a guided tour like this would make me feel more comfortable – and adventurous.